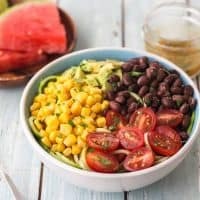 Crisp and refreshing this Southwestern Zucchini Noodle Bowl is a healthy meatless meal for one that you can easily double to feed two! 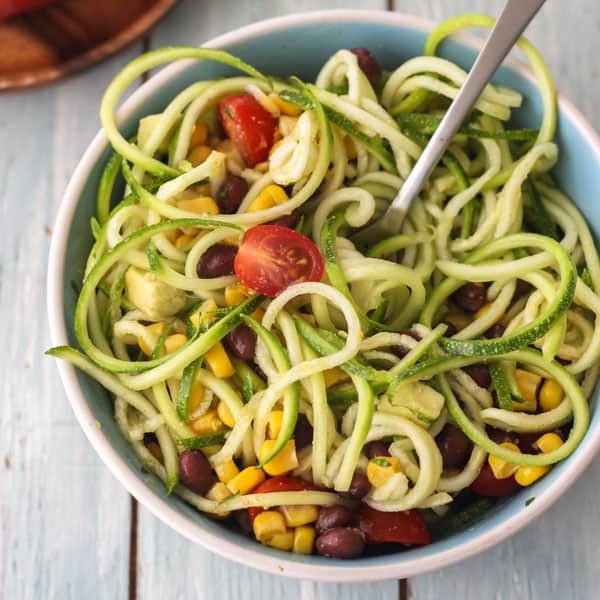 Spiralized zucchini noodles aka Zoodles are a great way to add more veggies to any meal, plus they’re fun to eat. Even though we love our toaster oven (some might say too much) we don’t cook EVERY meal with it. In our little household, we’re also fans of one-pot stovetop dishes, this yummy slow cooker vegan black bean soup (it’s so good you’ll actually look forward to the leftovers) and in the summer lots of crisp salads with tangy sriracha vinaigrette! After finally discovering the right vegetable spiralizer for us, I’ve been changing up my summer lunch routine with light and filling zucchini noodle salads. 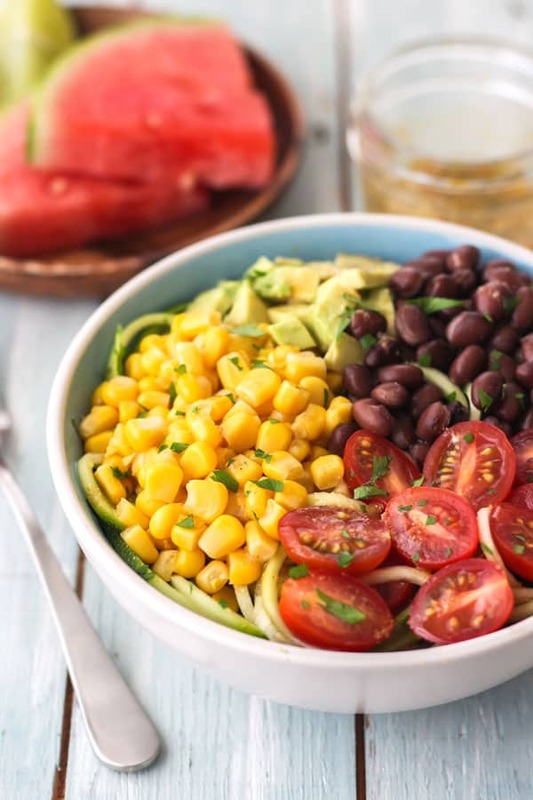 Right now, this Southwestern Zucchini Noodle Bowl is my favorite. The recipe comes together in just 15 minutes, including the homemade vinaigrette, and tastes deliciously fresh! To make your bowl grab one medium zucchini and spiralize it into noodles. Then whisk together your smokey Cumin-Lime Vinaigrette, drizzle it over everything and dig in! 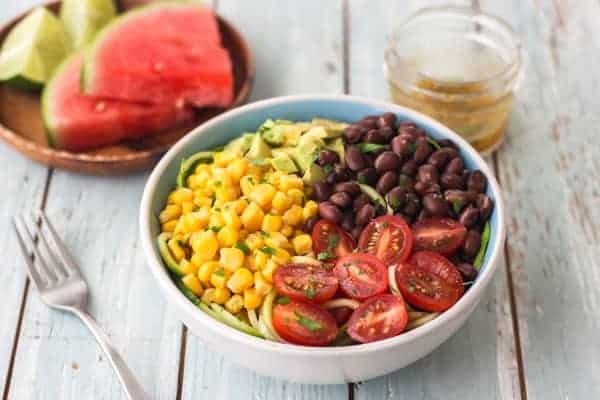 Crisp and refreshing, this veggie-filled bowl is a healthy meatless meal for one that you can easily double to feed two! Combine the vinaigrette ingredients in a lidded mason jar and shake until combined. (Or whisk together if you don’t have a jar) Taste and adjust seasoning as desired. Add all of the salad ingredients to a large bowl. Shake the vinaigrette jar again and drizzle about 2/3 of it over the salad, toss well to coat the veggies. Add more dressing if you like and season with salt and black pepper. Serve immediately. To spiralize the zucchini I used an OXO handheld spiralizer with the green spaghetti blade attachment. The red “ribbon” blade is fun too, it’s my favorite for making these Chickpea Cucumber Mini Pita Pizzas. A few years back we bought a large spiralizer but it was cumbersome and difficult to clean so we rarely used it. I like the handheld spiralizer better because it’s simple to work with and ridiculously easy to clean, which means we’re more inclined to actually use it. Another bonus is the size, it’s small enough to fit in a kitchen drawer! 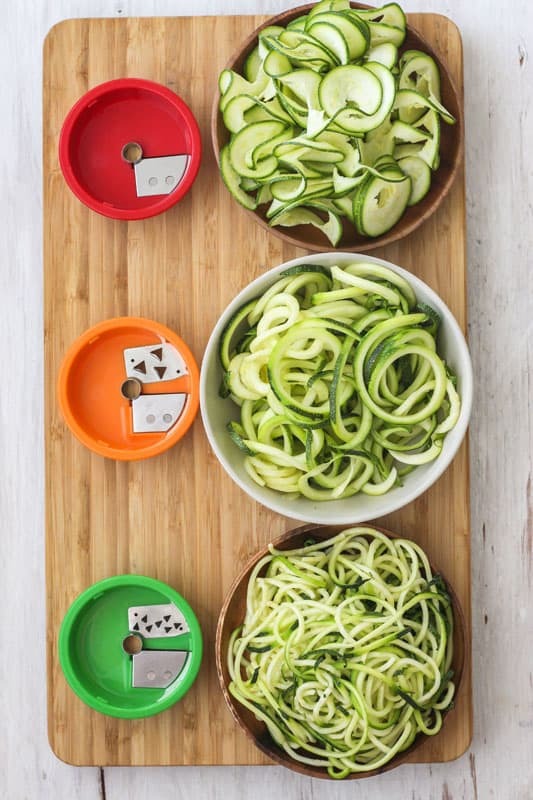 Who is a handheld spiralizer not a good idea for? If you have trouble with grip strength or plan to spiralize more than 2 or 3 zucchini at a time. In those cases, a larger spiralizer with a crank handle may be a better fit for you. Are there other ways to make zucchini noodles? Yeppers! You can use a julienne peeler, the noodles will be flat (not round) but still fun. 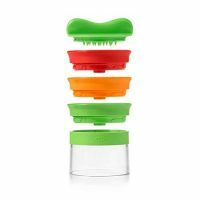 Here’s an Amazon link to the julienne peeler we use and like, it comes in a set with two awesome vegetable peelers. 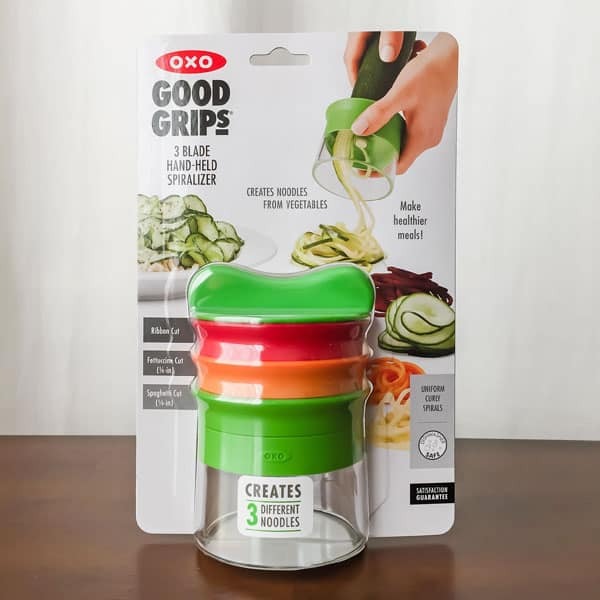 But if you don’t want to own a special tool you can always skip the “noodles” part and cut the zucchini into small pieces for more of a chopped salad vibe. Zucchini Bowl Tip #1 – Use a larger bowl than you think you need. All of my regular (ie. bigger) salad bowls were dirty, so I threw the ingredients into a smaller cereal bowl to make my lunch and take a few pictures. It worked great until I wanted to stir everything together. The noodles tried to climb out of the bowl and there were toppings going everywhere! Zucchini Bowl Tip #2 – Get creative with your salad toppings. If we have fresh mango I always add it. Chopped red bell peppers taste great. And make sure to throw on any fresh herbs you need to use up – cilantro, basil or parsley would be a nice addition. Avoiding food waste never tasted so good! Share your favorite way to use it in the comments below, we’re itching to try beets and maybe some apples with cinnamon and yogurt. Hit us with your best tips! spiralized veggies are so fun! i love the colors and flavors in your salad, well done!